(Nanowerk News) It takes at least two motor proteins to tango, according to Rice University scientists who discovered the workhorses that move cargo in cells are highly sensitive to the proximity of their peers. The study suggests that the collective behavior of motor proteins like kinesins keeps cellular transport systems robust by favoring slow and steady over maximum movement. The interactions once thought to be of little relevance are worthy of further study, according to Rice theoretical biophysicist Anatoly Kolomeisky. Small changes that may be controlled with medications can have a large effect on cell dynamics, an important consideration in treating disease, he said. His group's paper in the Journal of Physics A: Mathematical and Theoretical ("Theoretical analysis of dynamic processes for interacting molecular motors") describes a new theoretical approach to study the effect of intermolecular interactions on the dynamics of motor proteins that move along cytoskeletal filaments known as microtubules. Motor proteins powered by adenosine triphosphate, which supplies chemical energy, "walk" along microtubules to deliver cargo throughout cells and discard trash. Previous work by Kolomeisky and his students showed how microtubules are continually built, destroyed and rebuilt by cells that reuse the molecular building blocks like Legos. The new mathematical model built by lead author Hamid Telmouri and co-author Kareem Mehrabiani, both Rice graduate students, analyzes short sequences of those blocks to demonstrate that both strong and weak interactions are important to regulate the flux, or movement, of motor proteins. "It's known that these motor proteins work together, and that when two motors are next to each other, they interact," Kolomeisky said. "It's relatively weak, but it is an interaction. The question we raised is, What is the role of these interactions in overall cooperation? "What we've done that other groups have not is treat these interactions in a thermodynamically consistent way," he said. 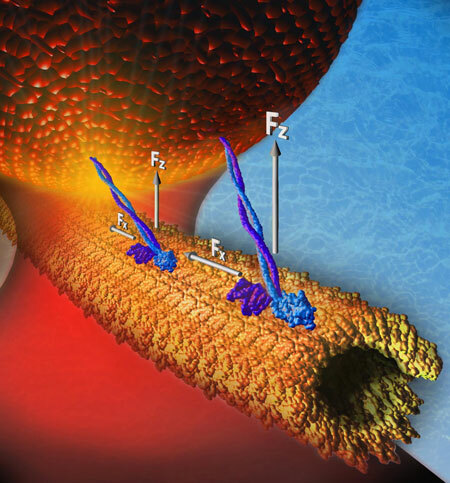 "When two motor proteins sit next to each other and one moves away, it breaks the interaction. If they come together, they create an interaction. Effectively, that's like a chemical reaction." The researchers applied a model known as a totally asymmetric simple exclusion process, commonly used to study interacting particles in physical, chemical and biological systems. "We built a model of a linear track and motor proteins that can bind at one end, can move and can disassociate at the other end, and we added the fact that when one sits next to another, they can interact," Kolomeisky said. "Surprisingly, we found in our simulations that having no interaction between the motors is not optimal." By adding factors to account for thermodynamic attraction and repulsion, the researchers learned that motor proteins, sensing the bigger picture, adjust for fluctuations in their fluid environment as they gather in clusters that slow movement or spread out to speed things along. Strong attractions or repulsions tend to diminish over time; this lessens their effect on particle flow and suggests that intermediate interactions have greater effect. In fact, the researchers were surprised to find that weak repulsions led to maximum movement along the microtubules and that motor proteins are more sensitive to attraction rather than repulsion. Strong attractions, they found, led to clusters that stopped the motors in their tracks because individual particles were unable to break away. Monte Carlo simulations with up to 1,000 blocks, a realistic size for a microtubule, confirmed the results of their calculations with smaller systems, Kolomeisky said. "We realized that first, biological systems might not be optimized for maximal flux but for something else. Second, our theory shows the system is very sensitive to small changes. In other words, a motor can easily adjust itself. You change a little bit of the interaction, and the motors change flux significantly." Kolomeisky said the new work helps chip away at the mysteries that remain to be solved in cellular dynamics. "The more we understand about fundamental features of these biological phenomena, the better for us," he said. "This is one small part of a huge puzzle."